Eight years? Has it really been that long since I opened up a blog page and typed my first ever post on this blog? Um, I think I am more shocked than anything else. For one thing, I can’t believe I have a nine-year-old child in the house now. Actually, scratch that. I KNOW I have a 9-year-old in the house now since she reminds me of it daily! As for the blog, I doubt I can do justice to this post today, because, as crazy as this may sound, this piece of virtual real estate is so much a part of me. I just cannot begin to tell you all how good it feels to type a post here, write a snippet, relate an anecdote or share a parenting lesson I’ve learnt. How can I possibly say all that I want to say in one blog post? This last year alone has been so incredibly wonderful. I’ve made many new blogging friends, started and maintain a new fiction/writing blog, started a new blogging group, got my own domain name, began a new job and just so much more. What do I have to share from these 8 years that I haven’t said already? Considering I was so sporadic when I began blogging and then jumped into the posting frenzy last year and slowed down to a regular schedule this year (more or less), I’m hardly the authority on blogging practices. But then again, that’s never stopped me before, right? So, let’s give it a whirl. Happiness- Well, obviously! 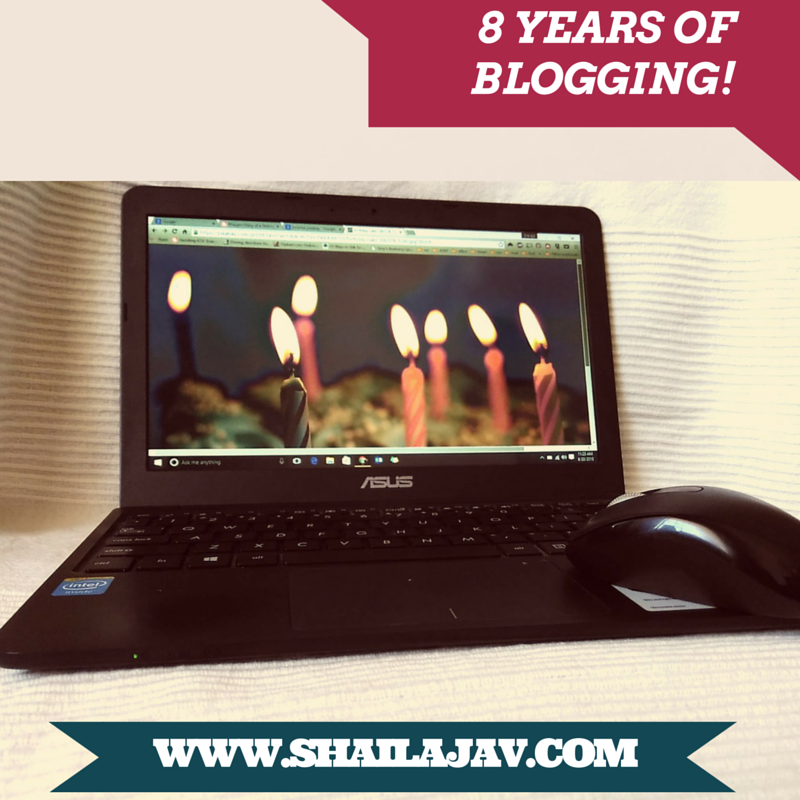 Happy that my blog is 8 years old, happy to be in this thing called blogging and happy that I can share this with so many readers. Gratitude– I cannot thank enough people for the existence and survival of this blog. But, primarily, I am grateful to Gy, my daughter, for the original inspiration and the continued lessons that she imparts through her wisdom and witty repartees! Peace– There is a sense of calm when it comes to blogging now. Maybe it’s the writing process or the idea of doing it regularly, but I feel calm when I blog. This absolute sense of peace settles on me when my fingers move over the keyboard. Purpose- There is a greater sense of purpose today when I blog. I know that for many people, it seems odd or weird when I seem to plug away at posts here and on my other blog, but writing gives me a sense of purpose. It puts my heart on display, so to speak. Connected– The best part about blogging, for me, is the engagement which turns into connections. Some of these are such solid ones that I can start listing the people who have shaped me as a blogger and not be done with the list even a week from now! Openness– I wouldn’t say I was ever the ‘jumping to conclusions’ type, but I have been guilty of being judgmental, especially where other parents were concerned. Starting and running a parenting group in conjunction with the lessons from my Yelling Less challenge has helped me embrace the differences in parenting styles much better. Inspired- 8 years is a long time to be doing one thing. If anything, it has strengthened my resolve to continue doing this thing that I love. Without my blog, I really wouldn’t be where I am today and although that sounds trite, it’s the absolute truth. You know, I had intended to do something special- a contest or a giveaway or an ebook of some favourite posts- anything, to mark this day. But I just never got around to actually doing it. I’m not a big fan of doing something for the sake of doing it, as those of you who know me will attest, so I decided not to push myself. Maybe all of that or some of it will happen, at a later stage, when I am ready for it. Till then, I just hope that what I write will continue to touch readers in any way possible. Thanks for sticking with me and thank you for coming along on this journey. Congratulations!! Many more, it is so good to be connected to you. Truly blogging has opened a whole new world and so many new ideas.8 years…you could write a book about the wonder years…. All the best. May your blogging ride from strength to strength. Congratulations Shailaja. This is truly a special moment for you 🙂 continue to inspire many more people with your posts. Keep spinning the magic with your words! Shailja, Hearty congratulations for the great achieviment. Hugs to your sweet daughter. Yay so nice to see this post :). Congratulations my dear Shailaja, and here's to many many more years (a lifetime? :)) of blogging and writing! That's wonderful, Shy. I have known you hardly a year of that time but have loved every time I tread this space. I also quite like the person that you are. Here's to many more achievements and blogiversaries. Lots of love. Have you been blogging for 8 years?? How come I never 'met' you before? I have been blogging for almost 8 years too and didn't come across your blog until a couple of years ago I think. Funny that. Congrats on 8 years! You have achieved a lot and it's a great way to connect with other word-lovers from across the globe. TO say that I am touched would be an understatement! Thank you so much for your kind words, Uma! I really could, right?Wonder what I am waiting for 🙂 Thanks Inderpreet! Thank you Gayatri. It does feel wonderful! A lifetime seems like a lot 😀 But how lovely that sounds!